“Bird by Bird”Â is the title of a wonderful book on writing by Anne Lamott, and it’s also as good a title as any for my next series of posts on opening analysis. Yes, we’re going to reach into Dana’s Secret Chess File ™ once again and pull out … the Bird Variation of the Ruy Lopez. This has been one of my opening workhorses ever since I started playing it in 1987; in fact, it is the most frequently played variation in my entireÂ opening repertoire. I’ve played 52 tournament games with it, and I have a record of 22 wins, 15 losses, and 15 draws, for a 57% winning percentage. Nothing spectacular, but for aÂ Black opening it’s certainly not bad. If you play double e-pawn openings as Black, the most frequent response you will see from White is the Ruy Lopez. So you had better be prepared with a variation that you can really rely on, and I’ve been completely satisfied with the Bird. In this first post on the Bird I’m not going to analyze any variations; I will just talk about the major strategic advantages and disadvantages for Black. Next time we will get into some specific variations. Let’s start with the immediate and obvious theoretical objection to 3. … Nd4. All the books tell us do not move the same piece twice in the opening, and here we’re moving the same piece twice in the the first three moves! How can we get away with this? To answer this question, I would like to call upon something that David Bronstein said in his classic book, 200 Open Games. He said that the main reason that Black loses in double e-pawn games (at least if he loses quickly) is that he fails to get his queenside pieces into the defense. So here I am on move 3, having played 2. … Nc6, and my opponent plays 3. Bb5. And what I see is a gift opportunity to bring my queen knight to the aid of the kingside! The move 3. … Nd4, which ordinarily would not even be conceivable because it hangs the e-pawn, now becomes possible because White has left his king bishop undefended on b5. So the maxim, do not move your pieces twice in the opening, is counterbalanced by another maxim, do not leave your pieces undefended. Thanks to the exchange on d4, the Black queen knight has performed the ultimate defensive service: it has eliminated White’s king knight, one of his best attackers. Not only that, but White’s bishop on b5 is out in no man’s land, doing very little. In the subsequent course of the game Black will usually aim for … c6 and … d5 (a plan I strongly recommend). White will usually play d3. And as a result, White’s king bishop, his proud “Spanish bishop” that is a key participant in so many kingside attacks, is completely disabled. So the two minor pieces that are the most common participants in kingside attacks, the KN and KB, are out of commission. If White tries to play for aÂ premature assault, he will find that he is curiously short of attacking material, with his other two minor pieces, the QN and QB, stranded on the queenside. A second crucial reason why I like the Bird variation is that it prevents White’s normal occupation of the center with c3 and d4. Many White players will be flummoxed because they don’t have their normal central space advantage and they don’t know what to do. In fact, some people will make a mistake right away and play 5. c3? Black meets this with 5. … Qg5! immediately equalizing (or better)Â because of the fork on White’s two undefended pieces, the bishop on b5 and the pawn on g2. White will usually play 6. Bf1, undeveloping his bishop, and now Black is basically a tempo ahead, as if he were actually White. I call this the “Egg on Face Variation” because of White’s shame-faced retreat to f1. Strong players will not fall into this trap, but players under 2000 will do soÂ quite often, and it’s one of the nice little perks of playing the Bird Variation. So White can’t play 5. c3 right away. But what’s not so obvious is that even later, after White plays a sensible move like 5. O-O or 5. d3, the move c3 is still remarkably ineffective. As you will see in later posts, Black can often go ahead and let White take on d4, temporarily sacrificing his pawn, and instead play … d5 to blockade. White has great difficulty protecting the pawn on d4, because he has another pawn sitting behind it at d3. So he hasn’t really solved his problems. The pawn on d3 is still in the way of his KB, preventing it from doing anything useful on the kingside, and it’s also in the way of White’s queen. Usually Black will win the d4 pawn back with his knight, which will then become a powerful piece and the master of the position. So if White is deprived of his normal play with c3 and d4, what can he do? Many players will look at the position above and see the exciting possibility of a pawn storm on the kingside with f4 followed by f5 or e5, etc. And it’s true that Black has to take this very seriously; it’s probably White’s sharpest attempt at refutation. But in the variation that I’m going to show you, with … g6 and … Bg7, I feel that it is slightly wrong-headed. The secret weakness in Black’s position is the dark squares. But by playing f4 (unless he succeeds in following it up with f4-f5) White has blocked his own dark-squared bishop from getting to the weakened squares on Black’s kingside. With the QB unable to get to the kingside, and the KB unable to affect the kingside, what is left for White to attack with? So the most insidious attempt at refutation for White is toÂ aim for dark-square play. After … g6 and … Bg7 and … Ne7, White plunks his bishop down on g5. I have not faced too many opponents who did this, because it means they have to depart from their normal routine in the Ruy Lopez and come up with something original. However, one guy in Santa Cruz plays this way, and it more or less regularly leads to positions withÂ no winning chances for either of us. This is a little discouraging if you want to play for a win with Black, and it has caused me to think about including some other defenses to 1. e4 in my repertoire, at least against him. But let’s be honest: if after exhaustive analysis an opening turns out to lead to a draw, this is usually not construed as a problem for Black — it’s more of a problem for the player of the White pieces. So now I’ve told you what is good about the Bird Variation. What are its defects? Well, we’ve talked about the loss of a tempo. But Black can survive this because of the way he has disabled or exchanged White’s best attackers. The doubled d-pawns look like ugly ducklings, especially after they become doubled and isolated as a result of an exchange on d5. But actually, they are Black’s pride and joy. They control lots of squares, they keep White bottled up in the center, they prevent d3-d4, and they make his KB into an irrelevant piece. The only real problem with them, I think, is that they are rather static. 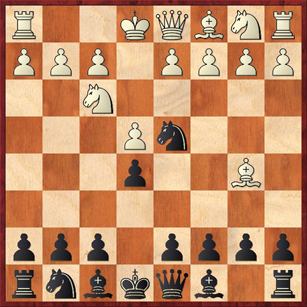 If the position turns in Black’s favor, sometimes he would like to open things up on the queenside and he can’t do it because he lacks the appropriate levers. Black also has to be a little bit careful sometimes about what endgames he goes into, lest the d-pawns turn into indefensible targets. Another possible problem for Black is the possibility that White will get a kingside attack after f4. But as I’ve said above, this doesn’t bother me too much. It’s a non-developing move that gets in the way of White’s own QB. 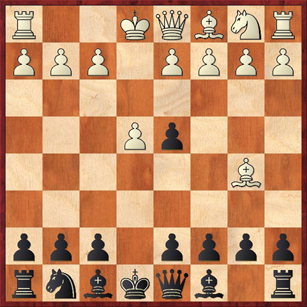 Black’s counterstroke in the center, … d5, should be sufficient to equalize. That’s all for now! Next time I’ll start fleshing out these general considerations with some specific lines. I just started playing the RuyLopez and luckily have not had the misfortune to run into this. Your chess never lacks originality. Good stuff. Dana – very cool analysis. Is your kingisde fianchetto analysis completely original? I have like 5 sources on the bird – sections of books from Khalifman, Shamkovich, Dangerous Weapons series, Shaw’s Ruy book and the new Sokolov book – and I have never seen it mentioned. Such original and comprehensive analysis is really fantastic, and you deserve all the rewards you are reaping in terms of the excellent results you seem to have with this opening. I am using your analysis to tighten up my repertoire on the white side. But even more so, I am feeling motivated to develop such sound and innovative original analysis myself….in some other opening. I like your original and logical approach, including the explanation of why the B seems awkward on c5, and therefore g7 seems logical. I also like the simple plan based on c6 and d5, and theextensive analysis where you test to see in which cases this plan needs tweaking. Awesome stuff. Thanks for the compliments! Yes, all of this analysis is original. In general, my approach to openings has been to develop my own ideas. I encourage you to do the same. If you haven’t already, check out my post “Dana’s Opening Philosophy” (July 2008). 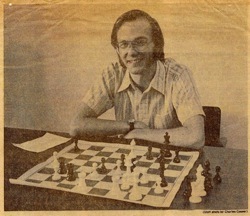 Basically my advice is to do what the grandmasters do — i.e., do your own thinking and research — instead of playing the moves that they play. The only caveat is that you have to be very honest with yourself when your idea isn’t working. There are people out there who enjoy coming up with freaky gambits that somehow never quite get refuted … but aren’t really sound either. I know because I’ve made up a few myself!